Enjoy white sand beaches and clear Baltic waters from the doorstep of your holiday home! This 2 bedroom villa, located on the Olpenitz Baltic Sea Resort, has excellent access to the water. 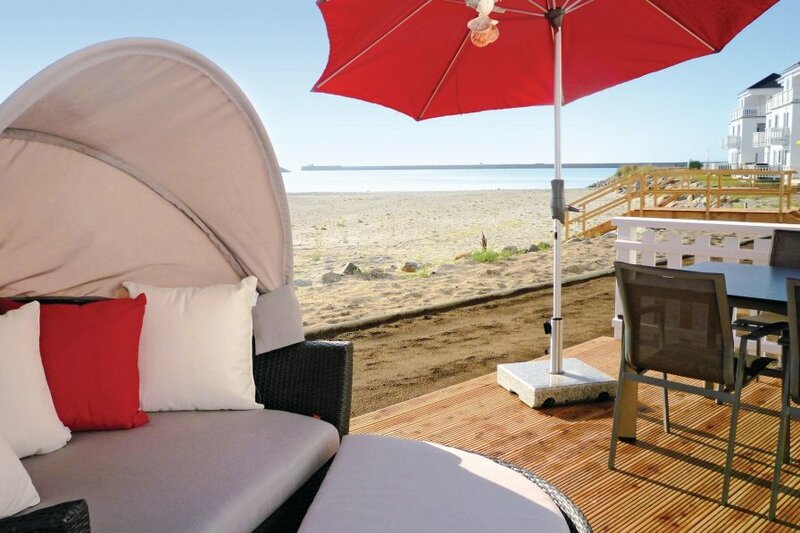 Enjoy white sand beaches and clear Baltic waters from the doorstep of your holiday home! This 2 bedroom villa, located on the Olpenitz Baltic Sea Resort, has excellent access to the water. Perfect for young families and small groups, the home has well-furnished eating and cooking areas as well as comfortable bedrooms. Besides two bedrooms on the first floor, there is also a bathroom equipped with massage jets and a large bathtub to spend a relaxing time. A special highlight of this home is a private sauna (with windows) on the top floor right next to the large ceiling terrace. Relax and unwind in the sauna and enjoy the view of water after a long, beautiful day in the sea. There is a separate shower room next to the sauna for additional comfort.This home has a fully-equipped kitchen with all comforts, such as, dishwasher, microwave, coffee maker, and an additional Senseo Coffee Pod machine and a utility room with a washing machine. Bathrooms have floor heating. In addition to a fully-equipped bathroom on the first floor, there is also a guest toilet on the ground floor with a separate shower in the sauna room. Please note: construction work nearby from 01/01/2017 until 31/12/2019. This beautiful modern house is made from wood and was recently built in 2014. The agent has rated it as a five star property so it is one of their best houses - tastefully furnished and fully equipped. It is also great value for money. This house has beautiful panoramic view over water; it is also only 6km from Kappeln. It is set in a very convenient location, just 800 metres away from a sandy beach and 20 metres from a sandy beach. There's also a restaurant 3km away. The house has free wireless internet. You can also park on-site at no extra charge. The house is well equipped: it has a refrigerator, microwave, washing machine and dishwasher. The property has a sauna; it also has a barbecue and some garden furniture outside.